Hosting a conference is a lot of work. There is a ton of planning that goes into it that Eric Dustin Brown and I did not realize and were surprised to prepare for. Finding the perfect place is difficult, and a truly perfect place can be impossible on a budget. Convention centers can be expensive, and even the local VFW Hall or Recreation center can cost upwards of a couple hundred dollars. Luckily, many LGS’s have an area large enough to host conferences, and would jump at the opportunity to get 50 to 100 people in their store buying sodas and selling Judge foils on a normally dead Sunday. Battlegrounds in Midlothian was a perfect spot for our event. The venue had 3 distinct rooms: one large enough for 15 people. One large enough for 30, and a main area large enough to house every attendee of the conference. Battlegrounds was willing to host the event for free – they even offered to close the store to non-attendees just to pack their doors on a slow day and to build a good reputation with Judges and potential future conferences. Now that you have a place set up, it’s time to get the talent ready. Every conference needs seminars, and that is one thing you can not do yourself. The Magic Judge program is a wealth of experience and knowledge to draw from, and you should not be shy about asking people to share their knowledge with others. For our conference, Eric and I both solicited some friends that we knew had things they wanted to share, as well as providing a way for Judges with something to share to let us know. We compiled all of that information into a google form, sent the form to each of the selected presenters asking for their preferred presentation times. Once you have a schedule of events, you need people to receive that information. Judge Apps is typically used as a place to solicit information about Magic events in search of Judges to work, but it can also be a powerful tool to solicit attendees for your conference. Keep in mind, contrary to popular belief, conferences are not an “auto-acceptance” event. If space is an issue, try narrowing down the acceptance criteria for your conference. Ask questions to make sure the applicants will actually get something valuable from or contribute something valuable to the event. The Virginia Judge conference had 66 attendees, including presenters. To narrow down attendees, we asked a few questions about what applicants would expect to get out of the conference. Any applicants who did not provide a thought out response were declined. In addition, we chose to decline anyone from outside the Mid-Atlantic Region. Be careful, staying too insular can block out important information from outside the area and can lead to somewhat of an echo chamber. For the first Mid-Atlantic Conference in two years, we decided this was a reasonable risk to take in exchange for the benefit of focusing on the Region’s needs. The more work that is done before, the more smoothly the event itself will go. This goes for tournaments, as well as Judge Conferences. Finalizing your schedule of events and getting a rough number of attendees for each conference can both help plan for space constraints, and can help your presenters mentally prepare for and tailor their content to the size of their audience. To do this, we created a Google Form for attendees. The form asked for names of attendees, and had a drop down menu per each time slot for each attendee to sign up for their preferred conference. You can find the form we used here. Feel free to click around – it isn’t being checked for responses anymore! A final spreadsheet was later compiled from the form data which can be viewed here. If you’ve done everything right, the day of the conference should be the easy part. Aside from making announcements, corralling Judges to their appropriate seminars, and being Santa Claus for everyone at the end of the day, your presenters should be doing the hard work at this point. Get your presenters to create some sort of feedback forms to both track feedback and make sure your attendees are actually learning new things or contributing to the event. 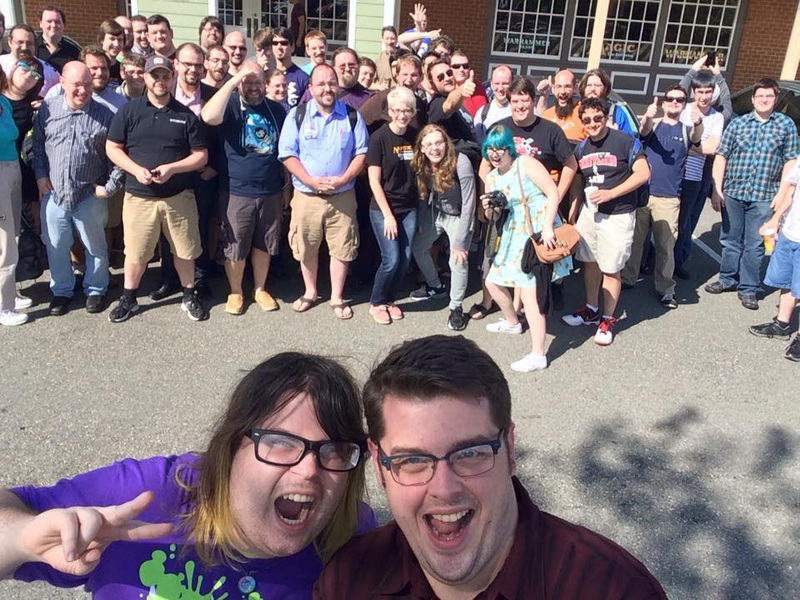 And, most of all, don’t forget to take a selfie with your attendees! Just because the conference is over doesn’t mean your work is done! For the Virginia Judge Conference, we created a feedback form so attendees can let us know how they felt about the conference, location, punctuality of the event, as well as any other comments, questions, or concerns they wanted to forward to us. This feedback can be invaluable, both for any future conferences you plan to help with in the future, and to share that information with any Judges from other regions who may be planning to run their first conference! You can find our feedback form here. Planning and running a conference is a tremendous undertaking, but it is also a very rewarding experience. After all, look at how much fun we had!